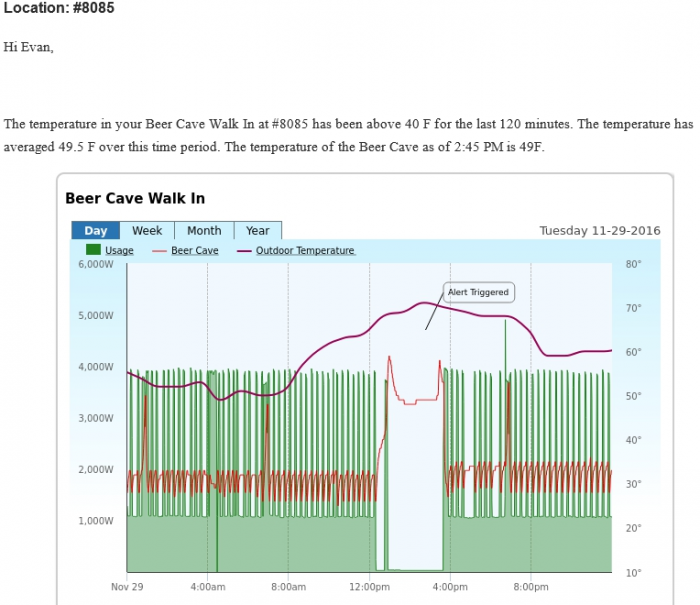 Everybody likes their beer cold when they pick it up, and one of our convenience store customers relies on SiteSage to monitor both the refrigeration temperature and energy usage for this critical asset. This SiteSage alert notified the facilities manager of high temperature in one of their Beer Caves. The facilities manager was able to call the store and run store personnel through a quick, basic troubleshooting without ever rolling a truck or risking product sitting in a warm box. In this case, the evaporator fan had tripped off and once reset, the unit recovered temperature quickly. Just to be sure that everything was OK, the facilities manager was able to keep an eye on the unit via his SiteSage app for the next 24 hours and didn’t notice any further issues. Interested in learning more about managing assets, operations, and energy at convenience stores?